Researching jaw-dropping destinations comes with my job. And don’t get me wrong, I’m not complaining, but that does come with certain drawbacks—like the fact that my bucket list is now hundreds of pages long. I have my work cut out for me to get to them all. 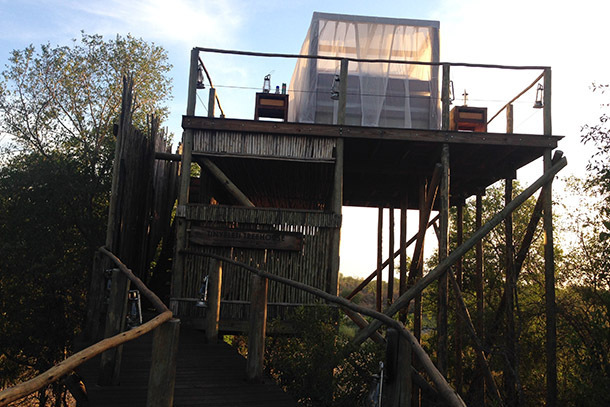 Case in point: Two years ago, while researching treehouse hotels for another story, I stumbled across the Lion Sands Game Reserve in South Africa, and I thought this open platform hotel in the middle of the African bush sounded simultaneously terrifying and enthralling. Naturally, I added it to my must-do list. Fast forward a few years: An airfare sale to South Africa meant that my dream could become a reality. 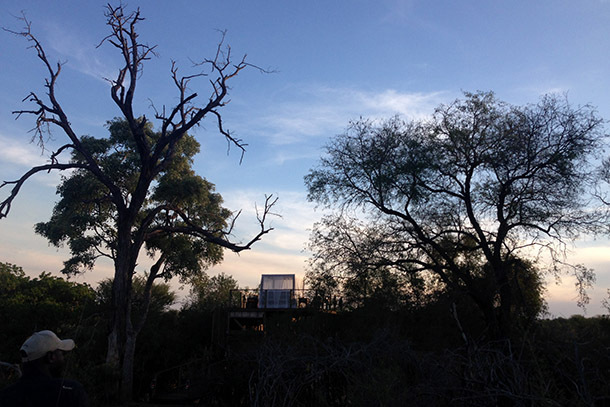 So did sleeping in an isolated treehouse on a game reserve live up to my expectations? Absolutely—although in my dreams, there were 100 percent fewer bugs to deal with than in reality. 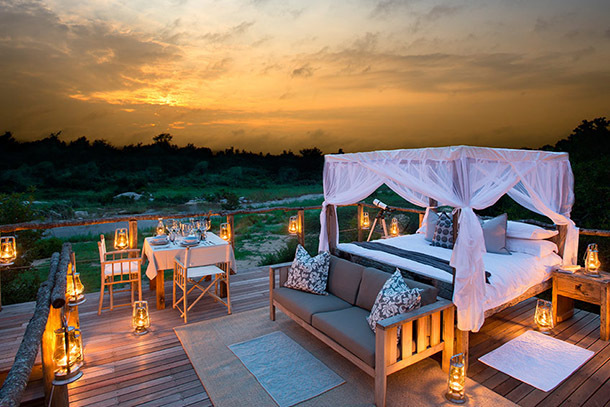 Checking into the treehouse at Lion Sands isn’t like at a normal hotel room. Instead, I checked into a room at Tinga Lodge—a regular hotel located inside the game reserve—where I could store my suitcase, shower after a long flight, and soak up some air conditioning before heading to the treehouse. I packed a small overnight bag with the essentials and set out on a game drive. After spotting lions, giraffes, and a leopard, I saw something even more exhilarating on the open plain: my treehouse looming in the distance. Tinyeleti Treehouse looks like a mirage as it springs up from the ground with nothing around it as far as the eye can see—no people, no buildings, and definitely no lights. My guide gave me a quick safety briefing (do not open the gate to the treehouse or leave the treehouse for any reason lest you get eaten by a wild animal) and drove off. The dining table is set with fine china. There’s no roof and no electricity, but gas lanterns illuminate the treehouse and there’s a working bathroom complete with running water, a double vanity, mirrors, soap, hand towels, plush bathrobes, and slippers. There’s also a cozy couch for optimal lounging before you retire to the plush king-sized bed. The view, uninterrupted for miles, is of the Sabie River, which draws many animals to its shores. You can relax on your deck and watch the parade. I switched on the provided strong flashlight after dark, and was shocked when it illuminated a hippo and her baby wandering just outside of our room for the night. This was something no one else on the planet was experiencing at the same time—something you don’t normally get even on a remote African safari, where there are always other people around. Once night falls, the sky lights up with stars. And because there’s no light pollution, you’ll be able to spot all kinds of bright constellations. Birds, frogs, and other insects all make their nightly noises, which—combined with the rushing of the river—makes a great soundtrack to fall asleep to. Of course, once darkness falls, the bugs come out with a vengeance. I didn’t have problems with any biting insects (possibly thanks to the treehouse’s provided bug spray), but I was bombarded by flying beetles who seemed to be attracted by the lanterns. Once I turned those off and took refuge under the bed’s mosquito net, they weren’t as much of a problem. If you’re nervous about sleeping alone and out in the open, you’ll be reassured by the two-way radio with which you can call a ranger, if necessary, as well as the cell phone with a direct line back to the main lodge. Help is never far away, but you won’t see anyone unless you want to. 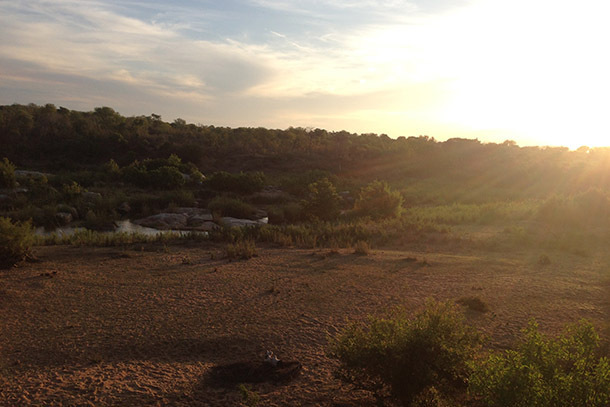 You won’t need an alarm clock to get up in time for your morning game drive—the sun will wake you up. There’s no better way to start your morning than sipping a cup of coffee (kept hot in a thermos) as you watch the sun rise over the river and the animals start their day. 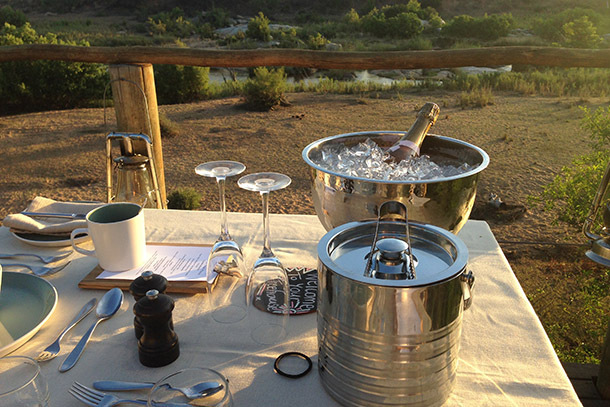 Caroline Morse received a discounted media rate from Lion Sands Game Reserve on her vacation to South Africa. Follow her adventures around the world on Instagram @TravelWithCaroline and on Twitter @CarolineMorse1.